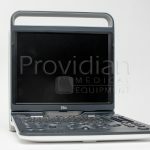 Providian Medical is the industry’s leading supplier of new and refurbished ultrasounds. We are known as the experts in ultrasound, making sure you get the best ultrasound at the best price. We carry ultrasounds from the top manufacturers, including GE, SonoSite, SonoScape, Philips, Chison and more than a dozen other brands. We provide the best customer support in the industry with an expert staff, dozens of free training videos, articles, and how-to guides. Following are reviews for some of our best-selling new and refurbished ultrasound machines. The new GE Logiq e BT12 is among the most popular and versatile ultrasound machines on the market today. As a fully shared-service system, it provides an excellent solution for mobile and a wide variety of clinical needs. The Chison EBit 60 has quickly become one of the top selling shared-service portable ultrasound machines available. It provides the highest value among ultrasound machines in its class. Reviewed by Brian Gill on October 19, 2018 . 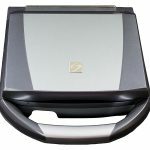 Among the top and best-selling portable ultrasound machines, the GE Logiq e is a go-to system for those looking for a mid-range shared service ultrasound machine that is good for all modalities. Available as a new or refurbished system, the Logiq e has become the most popular and trusted portable ultrasound machines on the market. Overall, GE is among the best and most popular ultrasound brands, we’ve even created an entire Guide to Buying GE Ultrasound Machines. Over the years, the Logiq e has had many improvements. Recent versions have improved cardiac capabilities making it an ideal ultrasound for mobile companies providing a wide range of services. All versions of the Logiq e provide solid imaging for OB/GYN, Vascular, MSK, Superficial, Needle Guidance, and nearly every other ultrasound modality. 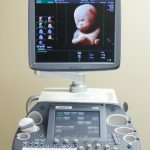 The Logiq e features many higher-end ultrasound technologies, including GE’s CrossXBeam and SRI (compound and speckle reduction imaging technologies). A stress echo option makes the Logiq e a complete shared service ultrasound machine. 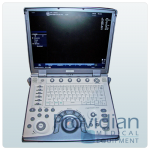 New and refurbished GE Logiq e ultrasound machines are available from Providian Medical with a wide price range depending on your requirements. The GE Logiq e is an excellent choice for a portable ultrasound, and customers are typically very pleased with its performance for the price. The Logiq e is available for both human and veterinary markets. Voluson ultrasound machines continue to be our favorite systems for 4D OB/GYN imaging. Volusons provide excellent image quality, ergonomic design, ease-of-use, and the best 4D in the business. The Voluson e8 took 4D ultrasound imaging to a new level for image quality, frame rates, and technological advancements. Recent versions include an option for HDLive, which provides a more realistic view of a fetal face in “Babyface” 4D imaging. For OB/GYN and women’s health, the Voluson e8 is an outstanding ultrasound machine, providing clear, excellent image quality even when scanning deep tissue. GE’s CrossXBeam and SRI HD technologies create some of the best diagnostic images in the business for all levels of OB/GYN imaging. Advances in GE’s Measurement and Analysis packages, such as AutoOB calcs, make for faster and easier diagnostics. For those looking for the best refurbished 4D ultrasound machine, the GE Voluson e8 is a best-bet for performance and price. Its available technologies, peripheral connections, and great image quality makes the Voluson e8 one of our favorite ultrasound machines. In recent years, the Chison ECO line has become our best-selling ultrasound machines for veterinary use, including bovine/equine repro as well as general in-office veterinary use. 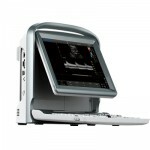 The ECO5 features color and PW Doppler, which make it the most affordable veterinary ultrasound machine in its class. Customers use the Chison ECO 5 for a variety of uses… from horse tendons, to bovine reproduction, to dogs and cats. There are a number of probes designed for this, including high frequency linear and microconvex transducers. Some choose the ECO5 vet’s sibling, the Chison ECO3, which is similar to the ECO5, however it does not feature color Doppler. Both systems are our most popular systems in their price range. Hitting the market by storm is the shared service Chison EBit 60. Within months of its release, it became one of our most popular ultrasound machines for sale. This shared service ultrasound machines provides excellent image quality, versatility, and performance at a great price and a long warranty. For those not needing cardiac, you can choose the Chison EBit 50, which is less expensive than the EBit 60 because it does not have CW Doppler. Some of the most popular applications for the EBit 60 have been for venous and phlebology practices seeking an ultrasound that has solid image quality, good PW Doppler, and at a price that allows them to buy multiple units for multiple locations. We have assisted these facilities in creating special custom settings that ensure consistency among all systems. With Needle Guidance software, Compound Imaging, Speckle Reduction Imaging, CW Doppler, and an excellent price and warranty, the EBit 60 has become the most popular and best-selling mid-range ultrasound system for sale. SonoSite has long held the top spot in durable portable ultrasound machines, particularly for bedside/point-of-care uses in which the physician performs the scan. The SonoSite M-Turbo is one of SonoSite’s best products, as it provides excellent image quality that competes with larger systems in its class. Simple, durable, and fast, the SonoSite M-Turbo is a great choice for physicians who are using the ultrasound for applications that use fewer measurements and calculations… where the system is used more as an imaging tool to evaluate tissue or guide a needle, rather than a full-time system. Its lightweight and durable design make the M-Turbo ideal for point-of-care and emergency department uses. It boots quickly and is ready for scanning within seconds of boot-up. This is among the most common choices for physicians doing needle injections or other point-of-care application.